When I say “lone wolf” I’m exaggerating quiiiiite a bit, but anyone who knows me knows that I liked to operate swiftly, quickly, and most of the time I ended up doing it alone. Not because I thought I was superior, but because I was uncomfortable asking for help. I always thought I should know how to do everything myself, and if I didn’t, I was a failure if I couldn’t figure it out. And GOD forbid I ask someone for help. It was like a death sentence for me. Well guess what? Things don’t scale that way in business, and relationships are what keep you sane. It’s boring AF. I truly realized the power of growing and learning with a group when myself and other collaborators launched a studio/creative collective last year. It had a good year run, and then we closed up shop in early 2017. What? You didn’t know about that?! Many people don’t. I took a LOT of lessons away from that which I’ll share at a later time, but the most important thing I took away was some close personal and professional relationships, and people that I’m proud to call my friends. My point being, is during that time, I had to lean on a lot of close friends who have done the company rodeo thing, especially in the entertainment industry, for honest feedback and as a sounding board. So… I’m going to let you in on a little secret and introduce to you two particular concepts that I’ve encountered in one way or another that’s helped me on my path to success through failure. 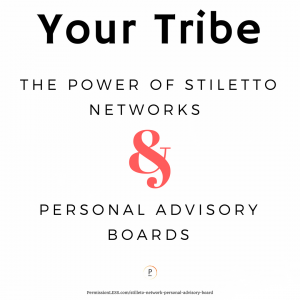 Those concepts are the Stiletto Network and the Personal Advisory Board (PAB). The Stiletto Network is a mutually beneficial group. The Personal Advisory Board is focused more inward and provides insight into your personal and professional challenges. When I first came across the concept of the “Stiletto Network” I have to admit; 1) Badass name. Anything that involves a stiletto and a “fight club” vibe is awesome in my book. 2) The concept behind it is extremely fascinating, and something that we’ve almost been doing but not quite hitting the mark on. “During the past few years, women’s groups have been coalescing in every major American city. Formidable ladies across industries are convening at unprecedented rates; they’re forming dinner groups and networking circles, and collaborating not only to achieve clout and success, but also to create a more just, equal society. The “Boys Club” has existed for-ev-er, and there are still some country clubs that separate the men’s area from the women’s area. And the thought of there being more concentrated power in groups of men also extends to groups of women. The Stiletto Network can be extended to men or mixed gender groups as well. While the power of this network is in the fact that it’s primarily women (I mean, the name…) the concept is one that transcends gender. I actually think there’s immense power in men and women conspiring together, but let’s focus on the true meaning of the Stiletto Network and its benefit in our lives. Not to make this sound like fight club (ok, I kind of want to make it sound like fight club, obvi because this is the second time I’ve mentioned it) but these are my interpretations of what will be needed to create or participate in a strong Stiletto Network (for either gender… but for the purpose of this, I’m referring to participants as women). Should be created with intention and purpose. Sitting around and chatting while having a drink is great, until you realize that it’s all you’ve done. It doesn’t have to be as formal as coming in with an agenda, but be mindful that time is valuable and you’re all there for an underlying reason. Should only be comprised of women you wholly trust. There may be sensitive information shared that shouldn’t leave the walls of your group. While this isn’t a necessity, there will be a benefit in having women from multiple industries, disciplines and business acumen involved. The more vantage points and knowledge, the better. Be highly selective about whom you invite in. I’m not saying this to be all Mean Girls, but what you get out of the group depends on who is invited to participate. No drama. Let me repeat this… No. Drama. No selfishness. No one who is only using you for your connections without anything to give back. Ego should not be present either. With having all mixes of women together, each should be understanding of the other’s professional choices and what they bring to the table. Don’t be afraid to ask for a favor and come in with the understanding that you’re all there to help each other. Asking for a favor, like putting in a good word and arranging an introduction with an investor that you’re close with, should be met with the willingness to extend a hand when needed. This is why it’s important to have people you trust that check their egos at the door. There’s no specific place or way to meet; just be sure to consider privacy. Want to use someone’s highrise apartment and sit at the dining table while discussing current events to the sparkle of city lights? Or reserve a private backroom table at your favorite sushi restaurant? Do what feels right for your group. Leverage this time to talk about game changing topics. Politics. Business. What you’re seeing in the financial markets. Industry trends. You want these meetings to be like a meeting of the minds, where you leave refreshed, excited, and with your mind slightly blown. How do you find these unicorns? Start connecting and building relationships. Eventually you’ll connect on a deeper level and get past the annoying small talk we all hate. Try finding local meetups for women in business, women in entrepreneurship, women in (insert industry/group here). Meetup.com is a great place to find local events, or you can scour for local women focused organizations and see what they have coming up to participate in. Spread out and go to conferences and events where you’ll find like-minded individuals. When you find “the ones” you’ll know — and it’s likely they’ll have someone in their corner they trust, and want to bring into your Stiletto Network too. It’ll start organically without you even realizing it. Propose the get togethers and see how they go. Don’t start them with any expectation and use them as a training ground to see how everyone interacts, and whether you’re building each other up with knowledge, truthbombs and interesting conversations, rather than spiraling. The PAB, from my interpretation and how I choose to share the concept, is extremely similar to an advisory board that you would see within the company. IE: They’re not always individuals who are hands on in the daily operation of the “company” (you), but they have a holistic, personal and professional understanding of the company (you) and are looked upon to give guidance in tough situations. Many times, people on advisory boards have different areas of expertise and different backgrounds, and have seen many successes and failures. They have history and grit. When I described the Stiletto Network above, one of the main benefits was that it’s mutually beneficial; meaning, you purposely ask for a favor, knowing that you’ll give someone the hook up in return. The advisory board scenario is more about *you* needing feedback and having people around you to support you. You may not be on the “advisory board” of everyone who is on yours, and that’s okay. Much like the Stiletto Network, jealousy (🎶heyyyyy jealousy!🎶) does NOT have a place. This is preferably a mix of those who know you both professionally and personally. The Stiletto Network usually starts on the professional side, and then the personal comes with time. That is, of course, if you didn’t join with a fellow warrior who happens to be both a friend and someone you know professionally. Unlike the Stiletto Network, the PAB isn’t really in place to talk about the happenings and going on in the world. They’re in place if you need specific help or feedback from varying sources. Your PAB members should feel comfortable sharing their experiences; the goal is for them to be able to provide perspective and options when you’re facing a difficult situation. You want honesty, not yes (wo)men. Your PAB doesn’t have to be the same people all the time. You can only approach one or two when you need feedback, as opposed to everyone. Or, you may rotate someone into the mix that you don’t ask for feedback from often. So, what’s the key difference? The Stiletto Network is fashioned as more of an event or club — a meeting of the minds, if you will. A Personal Advisory Board is ongoing. These people are your lifeline. They’re there for you through thick and thin when you’re having a business crisis, personal crisis (though hopefully not so much that) and are ready to give you feedback. I’ve tried and had different versions of the above two things. My PAB is still going strong and has basically kept my sanity throughout the past few years of entrepreneurship. I don’t know where I would be without them. And WHY do these things even matter? Because being a lone wolf is no fun. Life and business are driven by relationships, the joy others bring (and that YOU can bring to them) and different perspectives. We grow when we surround ourselves with people who are smarter than us, stronger in different disciplines, are the strengths to our weaknesses, or more experienced in areas we aren’t. You need a tribe in your corner, and what better way to have people in your corner than to cultivate a tribe of the best ones? I mentally catalog my PAB right now… it consists of those that I consider “my people.” I haven’t had the need to formally come out and call it that, but they definitely know that they’re my go-to, and I’m their go-to when they need me.